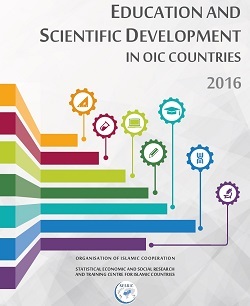 In this framework, SESRIC prepared the Education and Scientific Development in the OIC Member Countries 2016 report, primarily for the 8th Islamic Ministers of Higher Education and Scientific Research held in Bamako, Mali during 14-15 November 2016. The report analyses and examines the trends in the major indicators in the field of educational and scientific developments in the OIC Member Countries. The report investigates these trends in a comparative manner with their counterparts in the group of developed countries, non-OIC developing countries as well as the world as a whole. In so doing, the report highlights a number of constraints and challenges confronting the member countries in their efforts to foster their educational and scientific development. The report consists of five sections. In addition to an introductory section, it includes sections on participation to education, completion and progression in education, educational resources and teaching conditions, and research and scientific development. Thereby, the report covers important indicators of education, including, among others, average years of schooling, participation and progression in education, public expenditures on education, educational resources and teaching conditions, quality of education, and international student mobility. It also highlights the current stance of research and development (R&D) and S&T in the OIC Member Countries in terms of their average performance on some related indicators such as human resources in R&D, R&D expenditures, high technology exports, scientific publications and patent applications. Demand for education in many parts of the world continues to increase, which in turn offers developing countries an invaluable opportunity to prepare a well-trained workforce for growth and development. Educated, or skilled, workers are able to perform complex tasks and thereby contribute to producing more technologically sophisticated products. Especially in developing countries, skilled workers increase the absorptive capacity of the country by acquiring and implementing the foreign knowledge and technology, which is of crucial importance in successful economic diversification and development in OIC Member Countries. However, it is found that OIC Countries as a group are lagging far behind the other country groups in terms of educational outcomes. Although great achievements have been observed in many OIC Countries in improving access to education, it appears that there is still a long road ahead to improve the teaching conditions and quality of education in order to realise more concrete achievements in the area of science and technology.